On April 2, 2017, Rod Dreher’s The Benedict Option debuted at number seven for hardcover non-fiction on the New York Times’ bestseller list (promptly to drop from the list the following week). This new offering from Dreher is a summary of his life experience, a sort of manifesto for the conservative Christian seeking meaning in a world inundated by progressive agendas, commercialism, and shallow religion. The book’s popularity—and legion of detractors—is evidence of a growing movement of Christians seeking stability and solidarity in a world defined by secular forces. It remains to be evident if his vision is a viable option for the future. Dreher’s resumé in journalism includes writing for the Dallas Morning News and acting as Senior Editor for the American Conservative. His books include Crunchy Cons and How Dante Can Save Your Life. Those familiar with his writing may also know of his gradual progress from Evangelical Christianity, through Roman Catholicism, and finally to Eastern Orthodoxy. The Benedict Option is, in a sense, a reconciliation of Dreher’s past: Protestant, Catholic and Orthodox sources stand side-by-side, presenting an ecumenical legion of Christian opposition to progressivism. Doctrinal differences have been put aside in favor of common conservative values. While being presented as a strength of his vision, this dismissal of differences may also be a dividing factor. Anyone familiar with the various Christian traditions also knows of the variance found therein when it comes to core tenets. For example, a fundamentalist Protestant may be driven to vigorously challenge the teaching of evolution (and “old earth” views) within the education system; while the conservative Catholic or Orthodox parent may only find fault with the concept of “random” evolution: that which is meaningless and devoid of divine order. It seems naïve to assume that each Christian group will answer the question of self-preservation in the same way, or find fault with the same aspects of secularism. In addition, Dreher never addresses the conflicting ecclesiologies of each “branch” of Christendom. How he predicts that Protestants, Catholics and Orthodox will happily coexist in this post- post- Christian world is never stated. Perhaps he envisages that, in light of persecution from without, doctrinal differences will dissolve, resulting in a single liturgically-centered Nicene church? As this is unlikely, lumping all Christians into one group is perhaps a reckless decision on Dreher’s part. And yet, his recommendations for establishing Christian unity remain generally applicable. Dreher provides practical solutions for Christians concerned with the imposition of secularism upon their family. His recommendations include: abandoning public education, preferring rather private (religious) education, or home-schooling; relocating to be in close proximity to one’s church, thus forming intentional communities by which communion is established in social and religious spheres; and prudent utilization of technology, such as electronic media (internet, TV), to avoid addiction to media and technological dehumanization. While his suggestions comes as no surprise to many Christian parents (and perhaps many reading The Benedict Option are merely confirming their established views), such ideas may be a clarion call to those who have not yet assessed the danger of postmodernity upon the faith, culture and traditions of their family. Some critics of the The Benedict Option have stated that Dreher’s suggestions are only viable for affluent families. However, as an Orthodox priest of a community that differs widely in socio-economic statuses, I can assure you that many poor or working-class families have followed these paths, even at the risk of remaining poor. And after personally having dealt with militant secularization in urban public schools, and the onslaught of peer immorality, I (like many working-poor parents) find little that is redeeming in secular education. Contrary to some popular media portrayals of The Benedict Option, Dreher does not endorse a complete withdrawal from society, nor the creation of Christian communes. In fact, Dreher warns the reader of the danger of sectarianism and of establishing cults. While he encourages disengagement from politics regarding battles which, he concedes, have been lost, he also encourages Christians to defend the right to practice their faith without government interference, even if such a defense requires political intervention. Basically, Dreher fears that secular forces will attempt to forcibly (via legislation) disabuse Christians of their beliefs and practices. Although this is not yet a reality in the United States, this has already begun in Europe and Canada. The “chicken little” accusation hurled at Dreher may be little more than misplaced optimism in our democratic system. Time will tell, but we may yet see a popular opposition to Christian beliefs, including legislative opposition. In the end, Dreher may turn out to be a prophet of Christian political persecution. Regardless, the establishment of intentional communities—even while eschewing “guruism,” shunning and other cultic practices—can help traditional Christians overcome the sense of isolation and fragmentation experienced when living one’s faith in an unaccepting world. 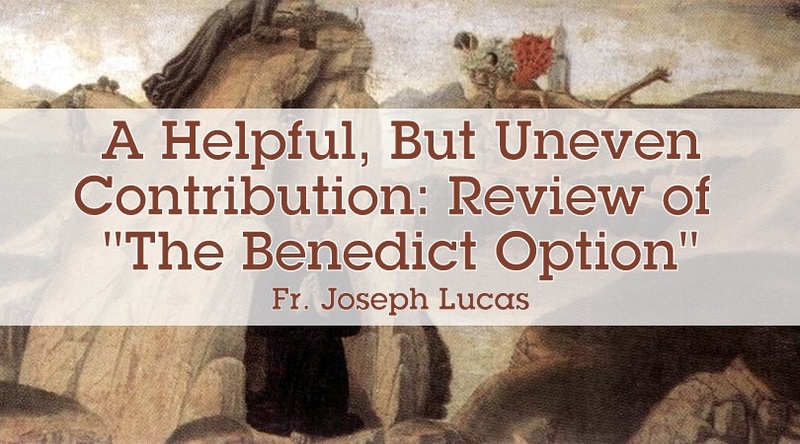 The weaknesses noted in The Benedict Option are numerous. Dreher’s prose is terse and, at times, lacking any organizing premise. It is obvious that the bulk of his writing has been committed to blogs rather than composed for a monograph. His chapters often read like a newspaper article, citing numerous sources (often anonymous, or at the very least, anecdotal), while evading complex evaluation. Some of his sources are solid; yet he deals with them superficially, leaving the reader bereft of a more complex analysis and application. For comparison, I reference the work The Shallows: What the Internet is Doing to our Brains by Nicholas Carr, which Dreher cites in his book. Carr is also an experienced journalist, focusing on technology. His New York Times bestseller is complex and readable, dealing with its topic in detail and building a substantial case for the author’s premises. While Dreher and Carr have similar journalistic backgrounds, the latter has corralled his talent in an exceptional way, proffering prose that is both informative and enjoyable to read. I wish Dreher would have spent more time in each chapter narrating the experiences of those who have been living the “Benedict Option” in the real world, rather than emphasizing his own moralizing rants. In addition, it would have been refreshing if he had taken on consumerism and greed in our culture, challenging the assumptions upon which “The American Dream” is founded from a Christian perspective. Instead, Dreher seems to assume that the common narrative of American life and success is essentially good, even offering a section on how to be a Christian entrepreneur. (He mentions the concept of Distributism—the ethical economic system of Chesteron and Belloc based on Catholic theology—only in passing, without exploring its possible impact upon western Capitalism.) It would have strengthened his stance, and distanced him from political allegiances, if he had taken on the consumerism and greed associated with the American exceptionalism. The most significant question that remained after reading The Benedict Option was: who is the intended audience? For many traditionally-minded Christians, Dreher’s suggestions are old hat. My assumption is that he is writing for conservative Christians who have not yet reconciled themselves to the current political and social climate in America. For those who may be vexed by the negative influences that peers and teachers exert upon their children, or who are tired of the anti-Christian barrage in the media, The Benedict Option may be an epiphany, inspiring one to decisive action. 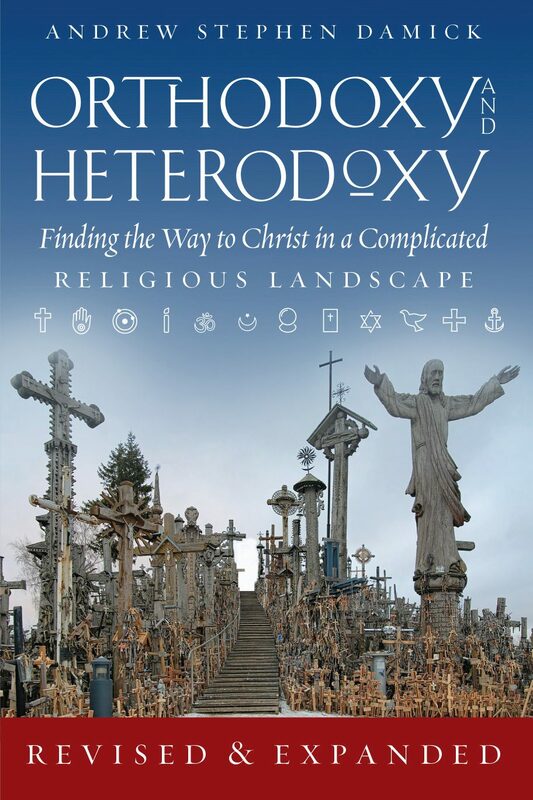 For others, Dreher’s work may be a reminder of how counter-cultural Christianity is vis-à-vis mainstream culture (though I would recommend instead other books in this regard, including C.S. Lewis’ Abolition of Man and David Bentley Hart’s Atheist Delusions). But in the final analysis, it may be that he is targeting religious Republicans who are fed up with politics and desire a wholesome return to their respective traditions. Those who expect to find something new and earth-shattering in this book may be sorely disappointed; but if you are looking for a few practical suggestions as to how one may stand against the tide of secularism, Dreher may provide you with a kernel—or two—of truth. Rev. Fr. Joseph Lucas is an Orthodox priest and doctoral candidate in theology at VU Amsterdam. He is author of "Prayer of the Publican: Justification in the Desert Fathers." Interesting review. Personally, I think Dreher’s proposal has some merit but is also not very realistic. One might do this if they moved to the underpopulated country setting and created a settlement, but that failed at Plymouth Rock and we have run out of frontier. It is a good first comment in a conversation that must take place. One idea that has also worked is for parishioners to purchase homes in urban settings within walking distance of their parish, in order to be more involved, and also to create a homeschooling co-op. Dreher cites the Roman Catholic community in Hyattsville, MD; but this has also been done successfully by Orthodox parishes, such as St. John’s Church (OCA) in Indianapolis. Obviously, this requires putting church affiliation/connection above other factors, such as commute-to-work time, neighborhood prestige, etc. I have not seen success at this, but then I have not seen everything. I am not saying that it won’t work because I know Protestant Pastors who have done a church plant in an urban setting with the idea of reforming neighborhoods. I just have not personally seen a great deal of success out these efforts. It seems to me that if one does this in an urban environment one takes the chance of the concomitant issues with urban crime driving people away. I know of a Greek Orthodox Parish that moved because their location, deliberately placed in such a neighborhood, led to many break-ins at the church and violence in the parking lot. The parishioners finally had enough and relocated leaving a very beautiful and purpose built Orthodox Church to settle into another building in a better neighborhood.